Testing on 36 beagles at a Michigan animal testing lab who were being force-fed with pesticides has ended. Following the release of an undercover investigation by the Humane Society of the United States, Dow AgroSciences (Corteva AgriScience) announced that it has ended a one-year pesticide test on the dogs at Charles River Laboratories in Michigan. We have reached out to Dow AgroSciences (Corteva AgriScience) to thank them for their decision to end the pesticide test, and to reiterate that we stand ready to work with the company on the release of the 36 beagles from laboratory. Our ultimate goal is to get these dogs adopted into loving homes. We have not yet heard from the company regarding next steps, but we will continue to communicate with the public on any new developments. This victory would also not be possible without the passionate support of people like you. Will you take the next step to help us ensure these dogs? 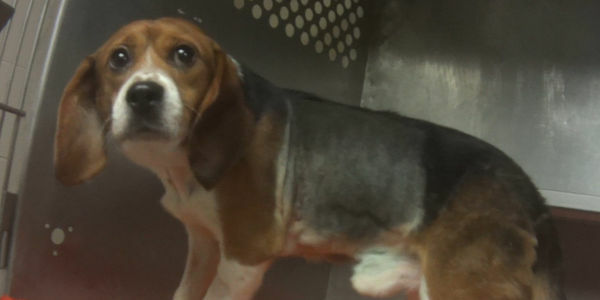 Join us in urging Dow AgroSciences to release the 36 beagles to the Humane Society of the United States and to our shelter and rescue partners so that they can be adopted into loving homes. Beagles in research released! Dow Agrosciences ended their pesticide test and has agreed to relinquish the dogs to our shelter partner, Michigan Humane. As we celebrate the freedom of these dogs, our work is far from over. There are still 60,000 dogs suffering in laboratories. Please join our fight to end this cruelty and protect all animals. Dow AgroSciences (Corteva Agriscience) has confirmed they will not release the beagles to the National Animal Interest Alliance (NAIA) - a group linked to organizations that profit off of animal suffering. Please contact Corteva at 989-394-3783 urging them to release the dogs to us and our shelter partner, Michigan Humane so they get to experience life outside of a laboratory. If you can't get through, send Corteva an email message here: https://engage.corteva.com/us_contact-us.